How Much Time do you Have for a Puppy? How Much Space can you Dedicate to a Crate? Are you Ready for a Mess? Crate training is an increasingly popular way of managing your dog. There are some advantages but there are also some disadvantages to this method. Let’s weigh the pros versus cons so you can make the right decision for you and your pup. I can completely understand why someone wants to have a dog but the truth is that not everyone has the time for them that they really need to thrive. A crate is a tool, but you don’t want to force your puppy to stay in a small space for too much of their life. Just because they seem happy when you come home doesn’t mean they had the best day waiting for you. If you are gone a lot of the day and no one is at home or you don’t have someone that can pop in take care of your puppy if you are delayed somewhere, then you should consider if now is the best time to add a dog to your life. A crate needs to be big enough for the dog. If you have a giant breed then you are better off getting the largest size crate right from the start because they will need the space sooner than you might think. Larger crates can take up a considerable amount of floor space so you need to think about if you are prepared to give that up. If your dog sees the crate as a punishment, they will be hard to crate train. Never send them to their crate immediately after scolding. The training must be approached from the idea that the crate is their space for relaxing and just “being”. A soft crate pad, toys, chews, etc can help make the space all their own. If you have a very young puppy you can even get pillows that have a heartbeat to comfort and soothe while they adjust to being away from mama and their littermates. Puppies must be allowed out to use the bathroom every 2-3 hours when very young. If you forget to let them out or can’t let them out, then you cannot blame the puppy for what happens. Some people use training pads and designate an area in the home that is okay to use the bathroom. I think these products and teaching that some indoor spaces is okay to use the bathroom it is a very bad idea that can be difficult to break when they are older. Establish good bathroom habits and use positive reinforcement now or your will have much more frustrating and difficult time later on. There is a lot of variety when it comes to dogs, and that means that some breeds do better with a crate than others. Energetic dogs are not a good choice for crate training. If you want to have a dog that stays in a crate part of the time then I advise a lower energy breed. Dogs get depressed just like people, and if they don’t get what they need to be fulfilled when it comes to exercise or interaction with others, they are going to be unhappy. You need to react in a similar manner each time there is bad behavior. It is also crucial to get your puppy into a routine. A pup doesn’t care if you want to sleep in until 11 am instead of getting up at the usual 8 am. They need to be let out on a schedule or walked on a schedule. How would you like to hold it in for an extra three hours? 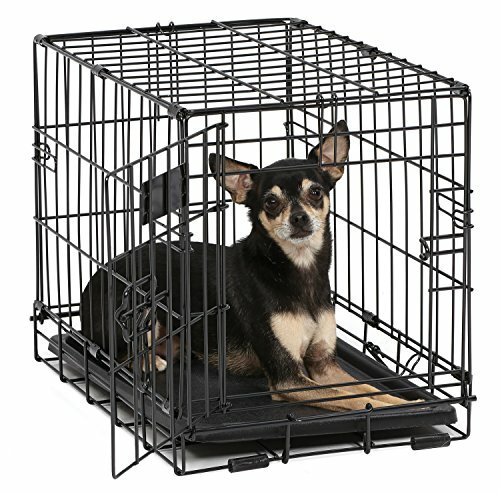 Some crates are soft, so they are more like dog tents, but the wire form is the most common. You can also get dog crates that double as furniture in your home. There are some handy pet parents that build their own. Soft crates are easier to manage and move than wire ones. You always drape a lightweight sheet or blanket over a metal crate to make a cozier feel. 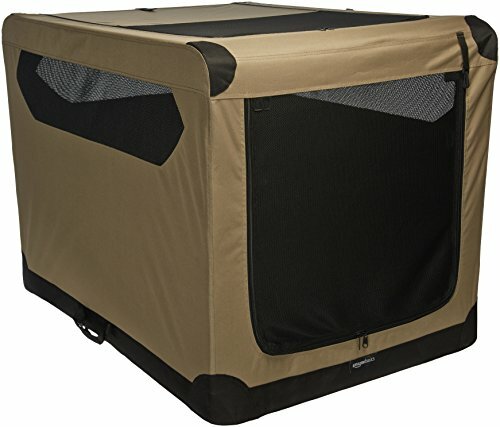 It is easy to keep the covering clean too since you can just throw it in the wash.
AmazonBasics Folding Soft Dog Crate, 42"
This large soft crate is good for dogs up to 80 lbs. If you have a smaller dog then it gives them a good sized space to play and lounge too! If you have multiple smaller dogs then this could work for a pair. The soft crates are kind of nice because they don’t look like a dog prison right out of the box and they can be moved so easily so if you travel and have a well-behaved dog, soft might be all you need. 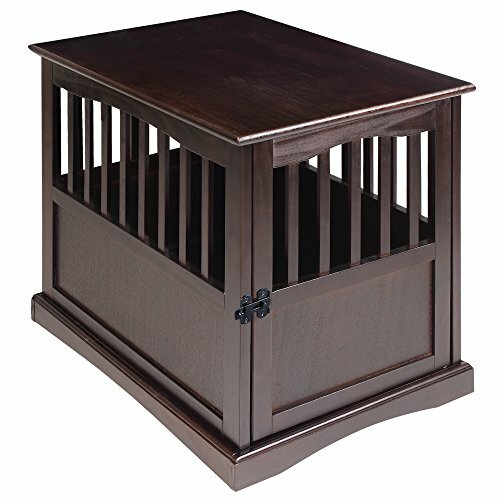 A big rambunctious puppy might cause some damage to this type of crate but it may be a good choice for them after you get them to stop chewing on things they shouldn’t. If you start with a smaller crate and then need a larger you might consider a soft one for permanent use in your home. This line of soft crates is available in many different sizes. The 18″ model of this crate is great for those with toy breeds and limited space or if you want to give them a bit more room there is the 24″. The crate is designed to avoid any dogs getting their paws caught. You can choose between a single or double door model. You get a sturdy washable bottom with this crate, but you will want to add a crate pad, bed or blanket for your dog to lay on. Most crates do not come with any accessories so just make sure that you get the right size pad or bed for the size of crate you choose. 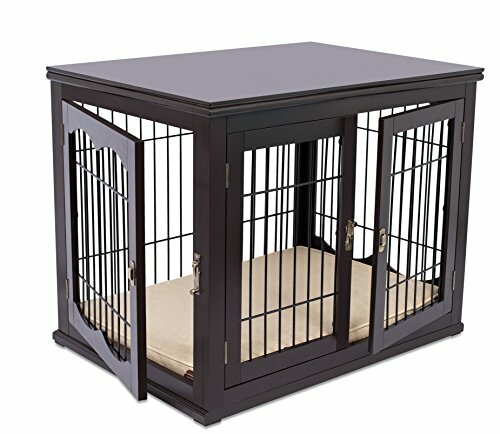 This is a classic example of just how nice a dog crate can look in your home. If you don’t like the look of the metal crates then this is one that might just be what you need. Who couldn’t use another end table? This end table crate comes in several sizes and allows for better use of your space. This would be perfect for those with limited space and a small or medium companion dog. Check out our post on Choosing The Best Puppy Play Pen for alternatives to traditional crates. While the principles are the same, these are usually a bit more spacious and some are designed for some outdoor use when needed. You will find both metal, plastic, and soft playpens covered so you can make a great choice when deciding what you need to train your puppy. The beauty of the puppy playpen is that some are expandable so you can start small and add a section or two as your puppy grows! All puppies are going to be a bit whiny and not want to stay in their crate at first. Here are the basic steps for getting started with crate training. 1. Set up the crate complete with bed, toys, and chews. 2. Have some small training treats on hand. Check out our post on training treats for some good suggestions. 3. Ask your puppy to come to the kennel. Many use the word “kennel” or “house” instead of “come” since that can be confusing when trying to get them to do other things. Just make sure you use the exact same work each and every time you ask them to come to the crate. You can use the word “carrot” if you want just as long as you use it every time! Lure them into the crate with the treat if they don’t go in themselves. 4. When your puppy enters the crate then you need to tell them they are good and offer any other praise you can. Give them the treat. 5. Walk away and stay away for 10 minutes the first time you do this. Start increasing how long you leave them in the crate until they are used to the time you need them to stay. 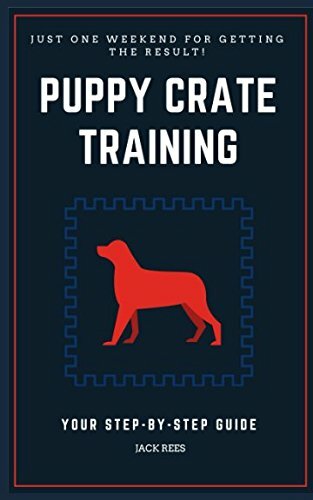 There are a lot of dog trainers out there that have written books on crate training. 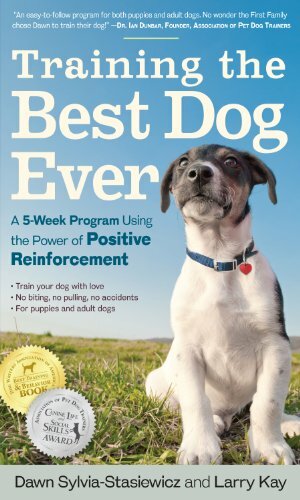 If you are a new dog parent, they may be helpful or inspiring. Just remember that all dogs are different and yours may not respond exactly how some other person’s dog did. Some dogs are more stubborn than others. This is sometimes mistaken for lack of intelligence in a breed but it is often just inherited behavior. I have Great Pyrenees, and they can be very stubborn, especially if they think you are doing something that to them seems unsafe. 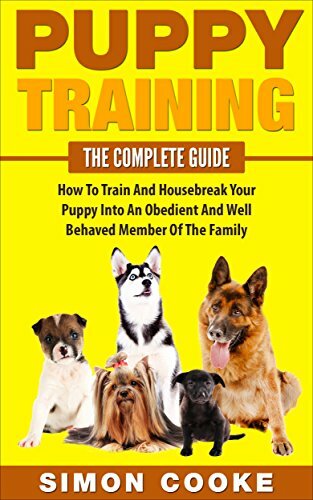 While some books may have titles that lead you to believe that your dog is going to be a perfectly trained puppy in a few weeks, the truth is that it depends on your puppy’s background and personality as well as time spent and the consistency of your approach during training time. Crate training can be used in combination with clicker training. For example, three clicks may mean go to your crate. Clicker training is quite popular and helps you stay consistent with your dog. Be patient and consistent and you’ll do great! Scout hopes this post has helped you plan out how you will approach crate training your puppy. While it can take some time to train a puppy well, it is very important to the enjoyment and quality of life for both puppy and their proud family!